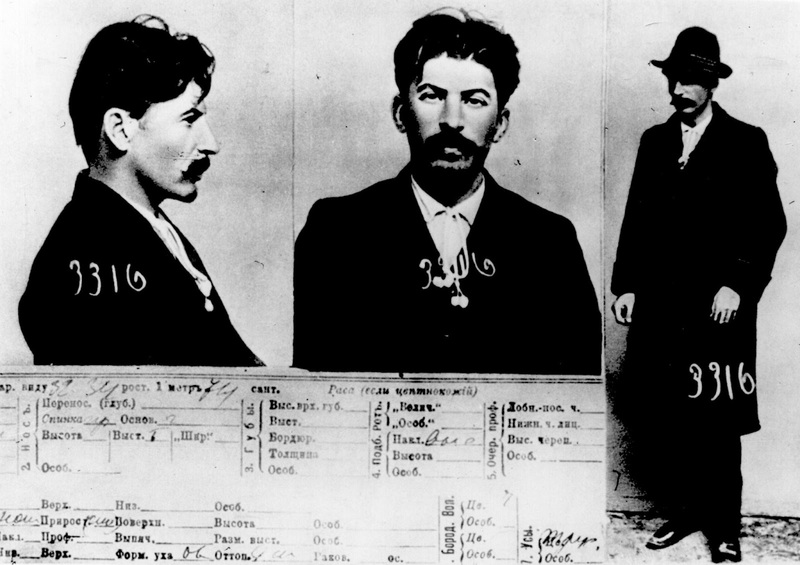 Mugshot of Joseph Stalin held by Okhrana, 1911. He was 33 years old. The information card attached to the mugshot says “looks around 32-34 years old″, it also says his ear shape is “6″. It has a separate paragraph for “race (if colored)”, for Stalin it’s vacant. The mugshot was taken in 1911, when he was arrested for the second time. In 1908 he was arrested for the first time by the Okhranka for revolutionary activities. After seven months in prison, he was sentenced to two years’ exile and was sent to the village of Solvychegodsk. After seven months in exile, he disguised himself as a woman and escaped on a train to St. Petersburg. When he was staying in Baku doing revolutionary activities he was arrested for the second time, this time for: terrorism, robbery and revolutionary agitation at Caucasus. He was banned from the Caucasus for five years and sentenced to complete his previous exile in Solvychegodsk. He was deported back there in September. In early 1911, Stalin’s friends tried to sneak him some money to help his escape, but the fellow exile who was supposed to deliver the money instead kept it for himself (Stalin had the man shot in 1937), and he was forced to return to Solvychegodsk. During his exile, he had an affair with his landlady, Maria Kuzakova, with whom he fathered a son, Constantine. Many say how handsome he was. Undoubtedly, this is true, but he wasn’t charming at all. He had very poor oratorical skills and he worked with a speech mentor who suggested he speak in a more calm and slow tone, like a father. Stalin was also described as “dull and pock marked”. What he did have was great skills in deception, a very good memory, and he was well-organized. He gained his charisma not by actually having it. Stalin created the cult of personality because he didn’t really have one.